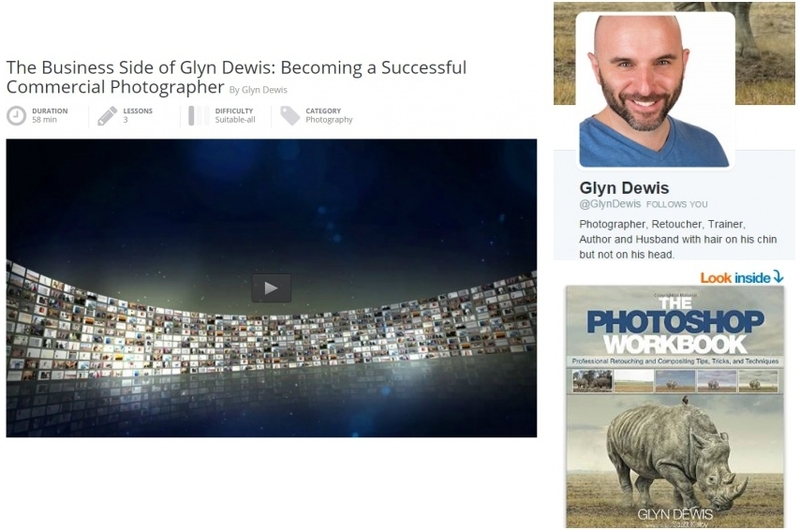 Right after Kelby Training (Kelby One) released the video "The Business Side of Glyn Dewis: Becoming a Successful Commercial Photographer," I watched it and decided to take a step beyond just watching the video. That next step is really what this post is about. Watching a video will do nothing for your photography career unless you take action. That action may be testing out what you learned from the video, making a connection with the person or persons in the video, some other form of action or all of the above. The key is to take some kind of new action based on watching the video assuming the video did not waste your time and is worthy of action. When I watched the video of Glyn Dewis mentioned at the beginning of this post, I thought that it wold be interesting to reach out to Glyn on social media. So immediately after watching the video, I Tweeted to Glyn and got a personal response in less than an hour. Needless to say, I was a surprised and impressed. That Tweet lead to each of us liking the others business Facebook pages which eventually lead to Glyn and I connecting personally on Facebook which eventually ended up in each of us following the other on Instagram. It's not realistic to think that every Tweet or social connection attempt will lead to everything in the previous paragraph, but that should not stop you in attempting to connect and/or communicate with someone that you respect in photography or any other industry. Social media has lead me down a path that no other platform on the planet can offer. For example, Canon USA has commented numerous times on my Instagram posts. On Twitter, I'm followed by Manfrotto, ThinkTank, Savage Paper and more. On both Twitter and Instagram, I'm able to get in front of photography brands that otherwise would not be possible. In other words, if you want to make something happen or at least attempt to make it happen, then TAKE ACTION. Don't be a woe is me photographer. Be a DOER, a GO-GETTER and be ACTIVE on social media. There is NO GUARANTEE that everything you do will be a success or lead to a relationship with someone. However, if you don't try and you don't do, then you will never know. The key is to keep doing what you are doing in a way that doesn't TICK SOMEONE OFF. For example, I don't Tweet to Glyn 5 times a day everyday. Glyn is a connections just like anyone else and a valued one. I wouldn't even Tweet (annoy) my best friend 5 times a day everyday. Use social media in a professional manner. Don't abuse social media. It's a great way to make key connections and keep your brand in front of the world. GO FOR IT!!! He has a fabulous YouTube Channel. If you enjoyed this post, please use the social icons below to SHARE IT with the WORLD!! !